Learning to Fly a Helicopter Is an Experience Like No Other! Whether you are thinking about becoming a career pilot or flying for fun, one thing is sure, flying a helicopter will be like nothing you have done before! We specialize our training in Robinson helicopters, which should be your only option when learning to fly. The most POPULAR helicopter used for training in WORLD. Our instructors specialize in Robinson Helicopters to provide our students with tools they'll need to and through earning their license. Upgrade to a professional logbook for $9.95. 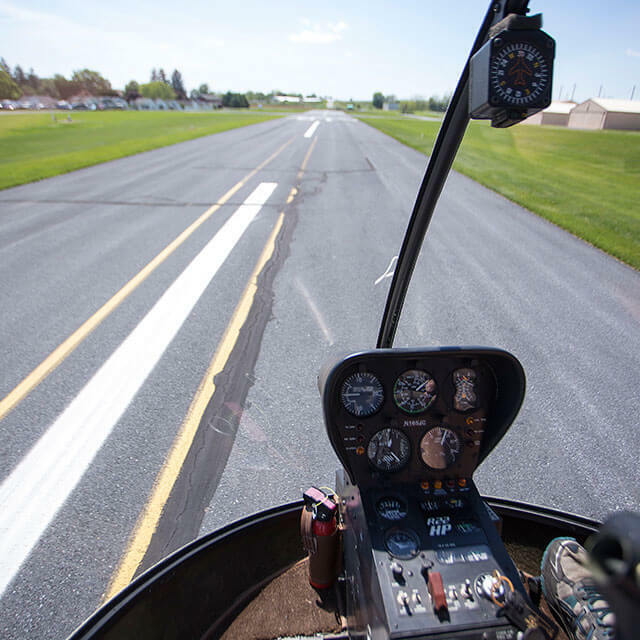 Our most popular gift certificate option, the Discovery Flight lesson, is a great option when looking for fun things to do in Lancaster, PA and is composed of a 30 minute ground session and 30 minute flight lesson. 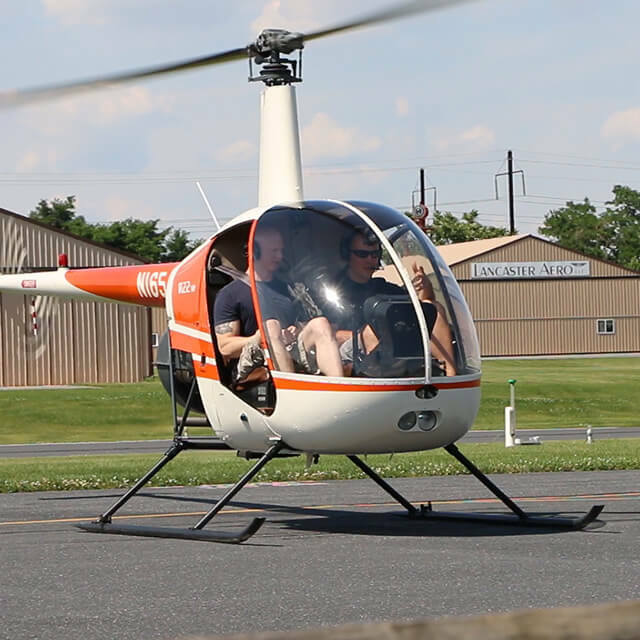 This will give you a more in-depth option to see what learning to fly a helicopter all is about while experiencing Lancaster County like you never thought possible. 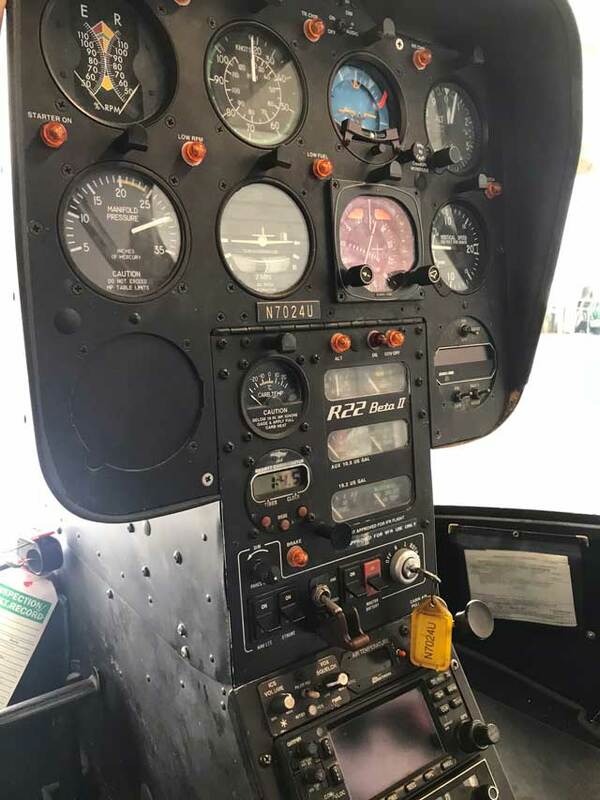 During the ground portion, learn to fly by going over the gauges of the helicopter and what each control is utilized for. Next, the certified flight instructor will walk you through your preflight checklist and, once completed, prepare to take flight! 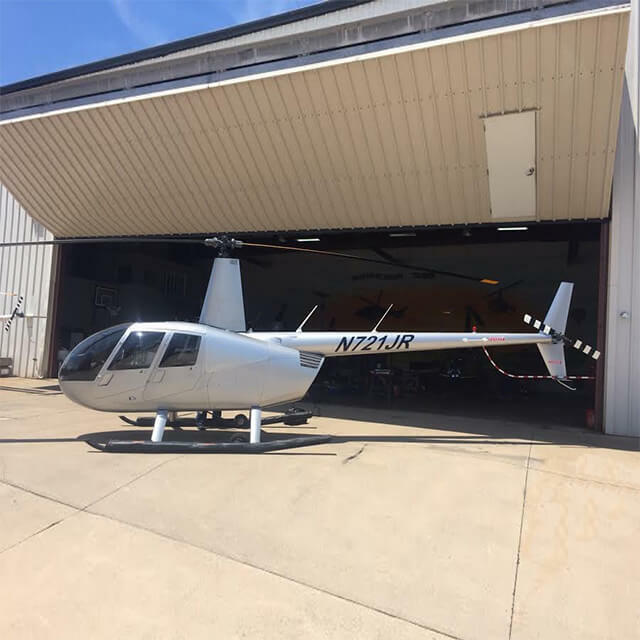 Your flight lesson continues as the instructor will teach you the maneuverable capability of the helicopter while taking off and climbing in altitude. In the in flight portion of your flight training lesson, the instructor will demonstrate the pedals, cyclic, and collective. Next, you will have the opportunity to experience most flight conditions, including straight and level flight, turns, climbs and descents. Last but not least, you will be given your chance to hover! At the end of your flight lesson, you will be provided with your first logbook and have it signed off by your instructor pilot for the time you flew with us. Earn your private helicopter license to kick start your pilot career! Ground Instruction $50.00/ hr as needed. Learn to fly anywhere you want, take friends and family as passengers, or even fly at night when you earn your private helicopter license! 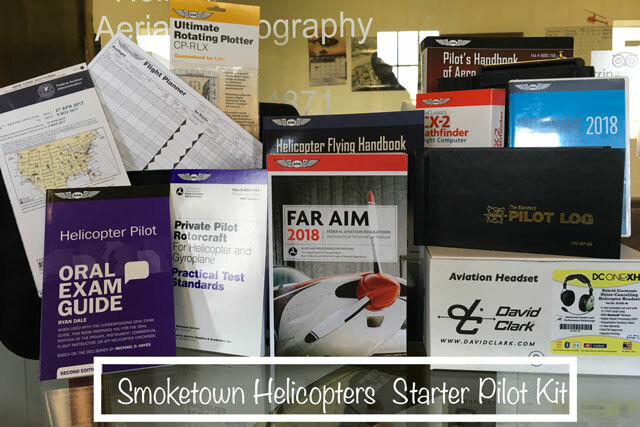 Begin your private pilot journey with flight training from your friends here at Smoketown Helicopters in Lancaster, PA. We will be there with you every step of the way to make sure you gain the proper knowledge and understanding required to succeed. The FAA minimum hours required to obtain your private pilot license is 40, but the national average needed is between 55 and 60 hours. There will be three stages of your private pilot license training to best help you learn to fly. Stage 1 will be pre solo flight training. In this stage of your flight lesson, you will gain all the training needed to solo the helicopter safely. Stage 2 consists of cross county aviation training. During this portion of your flight training, you will gain knowledge of how to navigate long distances in your helicopter. You will get the chance to fly cross county flights with your instructor along with completing cross country flight solo. Stage 3 is check ride preparation. To obtain you private helicopter license, you must pass a check ride with a designated pilot examiner (DPE). In stage 3, you will train towards meeting the published FAA standards that must be demonstrated on your official check ride. Once all the standards are met, your check ride will be scheduled. The day you pass your check ride you will be granted your private pilot license immediately! 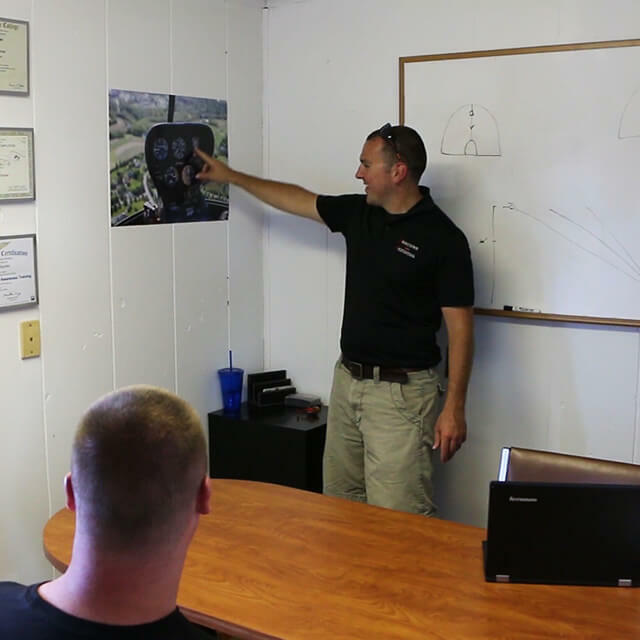 Complete a course of ground instruction with a CFI or an approved home study. 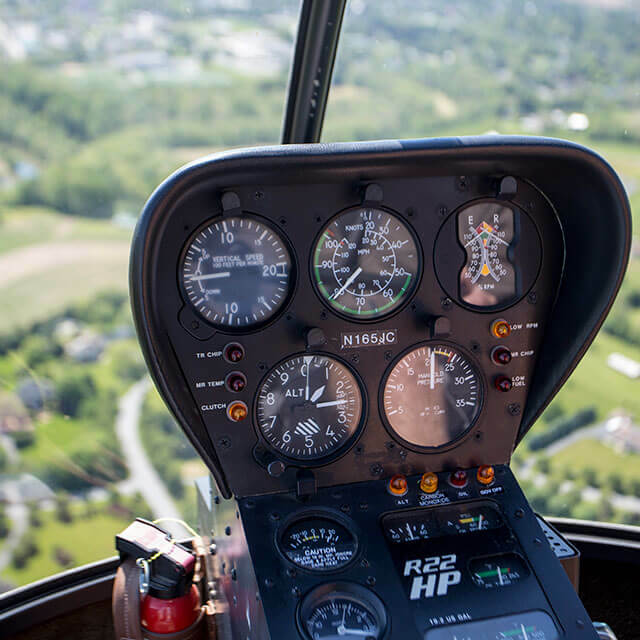 If you’re training towards being a professional helicopter pilot, an instrument rating will most likely be your next step after obtaining your private helicopter license. An instrument rating is a must have in the helicopter industry and a requirement to have for just about every helicopter pilot employer. To begin your instrument training, you will start with the basics of learning to fly the helicopter in reference to your instruments. Flying the helicopter in reference to your instruments without looking outside is one of the most challenging and rewarding accomplishments you can complete in helicopter flight training. After the basics of controlling the helicopter under instruments, you will then move on to learn how to navigate under instruments. In the final stage of helicopter instrument training, you will learn to fly approaches. Approaches allow you to descend into an airport from cruise altitude to a lower height above the runway in which you can land your helicopter if you leave instrument conditions. An instrument rating is not only the next step for the career minded pilot, but is also great for the traditional private pilot that wants to improve their skills and challenge themselves. Gaining your commercial pilot license will allow you to work for hire as a helicopter pilot. You will be able to fly missions like tours and photo flights and get paid for your services. During your commercial training you will learn what it takes to become a professional helicopter pilot. You will learn how to safely carry out commercial operation flights throughout your flight lesson. While completing this training, you will take many of the maneuvers that your have already been exposed to and hone in your skills to higher standards in preparation for your commercial practical test. You will also gain the ground knowledge of commercial regulations that you must abide by as a commercial helicopter operator. After obtaining your commercial pilot license, it is a great idea to get your certified flight instructor and certified instrument instructor ratings. 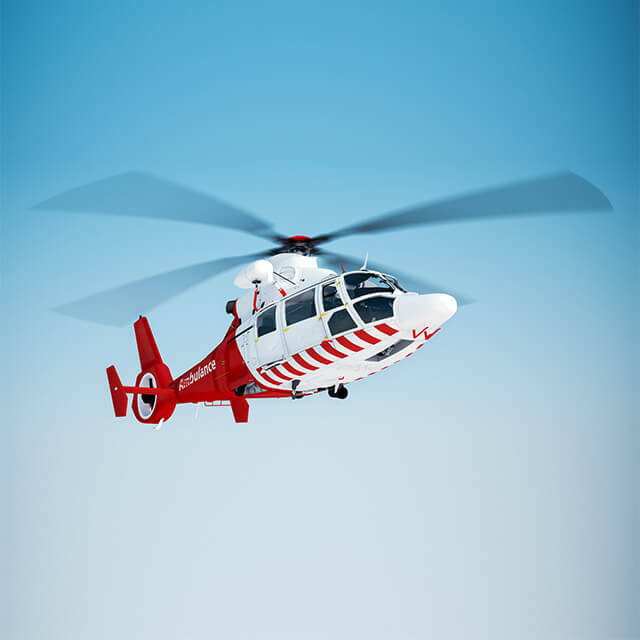 To gain an entry job in the helicopter industry, you must build time to 1000 flight hours. While working as a flight instructor, you may log all of the hours that you fly while providing flight instructing. You will also get paid while building this time and experience. This is the most traditional route that most people build flight time up to the 1000 hour mark. Once the 1000 hour mark is reached, job opportunities are available in the Gulf of Mexico flying workers out to oil rigs, flying tours in turbine helicopters at the Grand Canyon or Alaska. After working in these jobs you can then move into EMS helicopter flying if desired. The gateway to all of these jobs is through gaining your CFI and CFII. There is no hour requirement to get your CFI or CFII and usually takes 10-15 hours of flight training each. In your training your will learn about the fundamentals of instruction. You will then learn how to build lesson plans and how to teach those lesson plans in a classroom setting. You will then learn to teach flying maneuvers in the helicopter from the left seat. You will also complete training in full down autorotation prior to the check ride. After obtaining your commercial pilot license it is a great idea to get your certified flight instructor and certified instrument instructor ratings. To gain an entry job in the helicopter industry you must build time to 1000 flight hours. While working as a flight instructor you may log all of the hours that you fly while providing flight instructing. You will also get paid while building this time and experience. This is the most traditional route that most people build flight time up to the 1000 hour mark. Once the 1000 hour mark is reached job opportunities are available in the Gulf of Mexico flying workers out to oil rigs, flying tours in turbine helicopters at the Grand Canyon or Alaska. After working in these jobs you can then move into EMS helicopter flying if desired. The gateway to all of these jobs is through gaining your CFI and CFII. There is no hour requirement to get your CFI or CFII and usually takes 10-15 hours of flight training each. In your training your will learn about the fundamentals of instruction. You will then learn how to build lesson plans and how to teach those lesson plans in a classroom setting. You will then learn to teach flying maneuvers in the helicopter from the left seat. You will also complete training in full down autorotation prior to the check ride. No Flight Time? No problem! 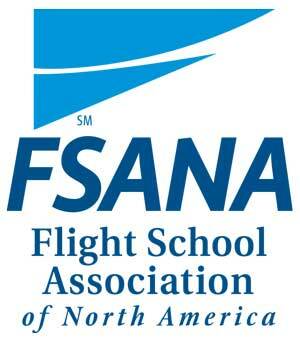 Our Professional Pilot Course was designed just for you! This course equips individuals from student to career pilot. The course will get you to your first job as a Helicopter Pilot. Do you already hold your Airplane Pilot Rating? If so, this is the course for you! Our PPL Add-on equips already rated airplane pilots with the tools needed to obtain their helicopter add-on. Price: Contact Us to Schedule an Appointment! Earn your Private Helicopter License in as little as 15 days! This course is intended for a self-motivated, driven individual that wishes to obtain their license in an aggressive manner. 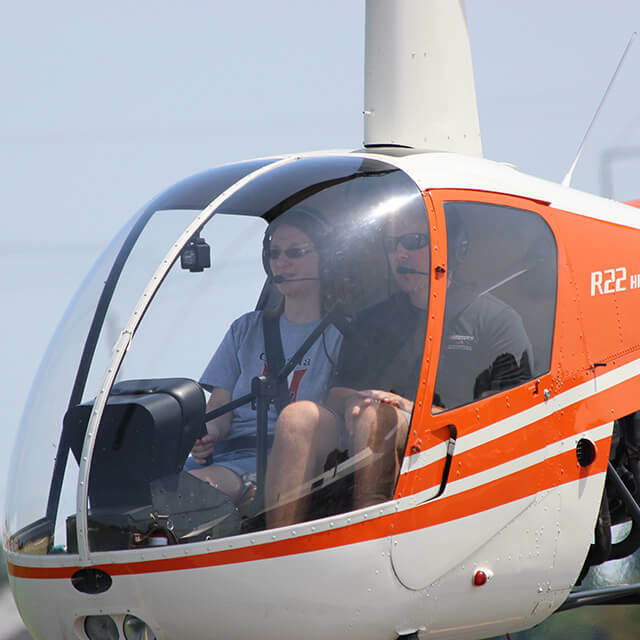 Aircraft and instructor availability is made a priority for the flight training student. Full days of training are mandatory for this course. Affordable housing and transportation can be provided as well. Obtain your commercial license from ZERO to COMMERCIAL PILOT in a little as 8 weeks. If you already have a rating we can customize the flight lesson and course to you and the course can be shortened. Obtain your instrument rating in 3 weeks or as quick as 15 days! Flight Circle Are you already a flight student? Log in to your Flight Circle account to set-up future training dates, book an aircraft for rental purposes, or manage your current invoices.